A new "supertall" skyscraper has been proposed for New York. The inverted "u-shaped" tower would be 4000 ft, the longest tower in the world and would stand at its curve approximatley 200 ft higher than One Trade Center, which is tallest tower in New York. The design is by architect Ioannis Oikonomou. who was influenced by the technology of horizontal elevators. I'm not sure that I like the design. What do you think? 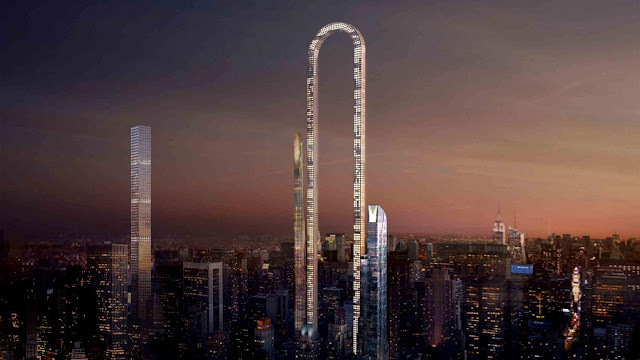 "The Big Bend: U-shaped New York Skyscraper seeks 'Longest in the World Title." Moore, J. 2017. http://www.newsweek.com/big-bend-u-shaped-new-york-skyscraper-seeks-longest-world-title-575267/. I don't care for the design either. Some modern architecture is a little too "out there" for me. I *think* that I posted this picture a while back; or at the very least, captured it. I like that you provide more information than I do, and links as well. Turns out I hadn't posted anything about this proposal, until today, and I included a link to your blog. I hope you don't mind.